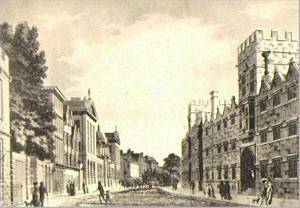 Oxford University, founded in 1214, is the oldest and best university in Britain. 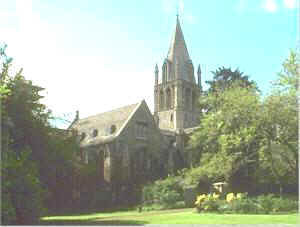 Over 30 individual colleges make up the university, and each has become affiliated to the central university at different points in time from the 13th century up to today. There is no "campus" as such, but you will find a cluster of very beautiful historic buildings that are used by all the colleges - the Bodlean Library, the Radcliffe Camera, the Sheldonain Theatre, the Ashmolean Museum in the centre of the town. The individual colleges are scattered around the centre as well. 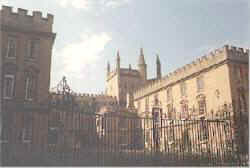 Each college is protected by a high wall, which is entered through the porters lodge at the main gate. 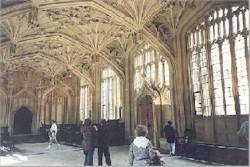 Once inside a veritable Pandora's Box opens up with courtyards and grass quadrangles, old buildings, the college chapel, its library, the students rooms. The only way to see what a college is like is to go inside a few. 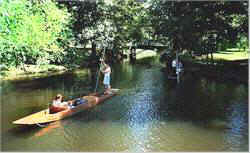 The River is an important part of university life, particularly in the summer term. 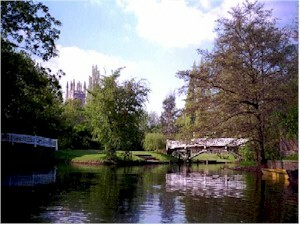 You get to the river by walking through Christ Church Meadow. 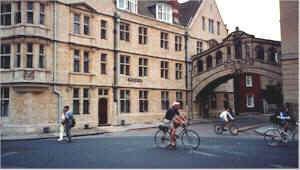 The Oxford University Boat Race crew train here in the winter, in the summer, the less serious and more spectacular Summer Eights take place.